The Holley 390 CFM carbs have been a staple for rodders around the world for decades. They're calibrated for use on stock to mildly modified vehicles and have that classic Holley look. Holley’s 0-8007 is calibrated and intended for small V8s or 6 cylinder engines as well as 2x4 street tunnel ram style set ups. Plus, it is Gold Dichromate coated for durability and classic Holley looks. Don't trust your performance to just anyone, Holley is the only modular carburetor company that has been in business for over 100 years and has powered every NASCAR champion since the 60's. JEGS Easy Kits are designed by JEGS professionals so you get all the parts you need in one easy step! 0-8007 is rated 4.8 out of 5 by 5. Rated 5 out of 5 by Peanut351C from Very Satisfied Delivered with in 3 days, installed it on the 4th. Awesome Results. Rated 5 out of 5 by ASRX7 from It worked great right our of the box. I followed the instructions and used the included gasket and it works great. My engine runs well and I only had to adjust the idle setting. Rated 5 out of 5 by Marz60 from Great Carb! This carb just plain works great. Holley gives pretty extensive setup instructions, but honestly, this thing bolted on and work great right out of the box. The only drawback is the electric (only) choke which cools down as soon as you turn off the ignition. even though the engine is already warm, the choke is not and goes back into high idle for a full minute or longer. Some adjustment is possible, but it's got me thinking about installing a switch to keep the choke pot warm when I duck into the 7-eleven or such. Annoying, but trivial perhaps. All-in-all this carb works great. Vacuum secondaries open when the engine is ready and not too soon which is important on stock small displacement engines. I installed this ;little 390cfm on a Ford 300 6-cyl on top of an Offenhouser split plane manifold. Is was a bolt on & turn key. You'll probably need a aftermarket throttle cable and Holley make assorted brackets that bolt to one of the carb studs. It's Holley quality all the way. The carb base gasket that comes with it is an open square design, so if you are going to use this on Split plane manifold, you'll need to buy a gasket with four indivual holes. In my case I had to use a 1 inch carb spacer as well. No, but his will be very close to what you will need and is adjustable if you want to change it. I have a 1965 Chevy 230 inline 6. Can you recommend an intake and carb? The only modification to the motor will be headers and an HEI ignition. Correcting the misspelling of the first question: Hi! I'd like to recover the original standard of my 390 cfm Holley. Can you tell me the primary and secondary jet size for this Holley, considering my engine is a Ford 302 V8 with approximately 145 HP? This only has jets in the front. They are size 51 should be ok on this particular engine. Hi, I&rsquo;m putting a stock 5.0 (roller cam) originally fuel injected motor, on my 82 mustang daily driver 5 spd, do you think this carb with a performer intake is a good choice ? Thanks ! This carb and the Performer intake should work well with a stock engine. The factory size pump is 25. There's numerous ways to trial and error your problem. Contact a JEGS tech and we'll help get you back on the road again. 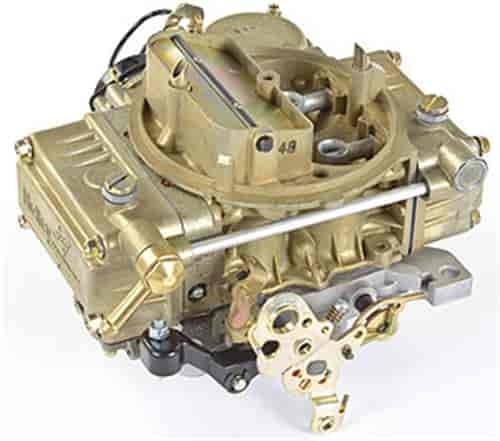 Would this carb by adequate for a sbc 327 which was originally equipped with a 2v carb. I've tried a 600 elderbrock, 600holley and a qudrajet and vehicle runs poorly. This should be fine to use with your 327 engine.